Okay, I got one mosaic done tonight. I wasn't planning on posting this tonight but decided to stay up and watch the season premiere of Battlestar Galactica that I missed last night as well as the last couple of episodes from last season (hey, it has been a year since last season). This mosaic is from Galileo's I27 flyby of Io that took place on February 22, 2000. This mosaic shows the Amirani lava flow at 207 meters (680 feet) per pixel. 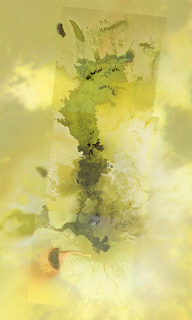 This mosaic was released at the time as PIA02567. I have created three separate versions of this mosaic. 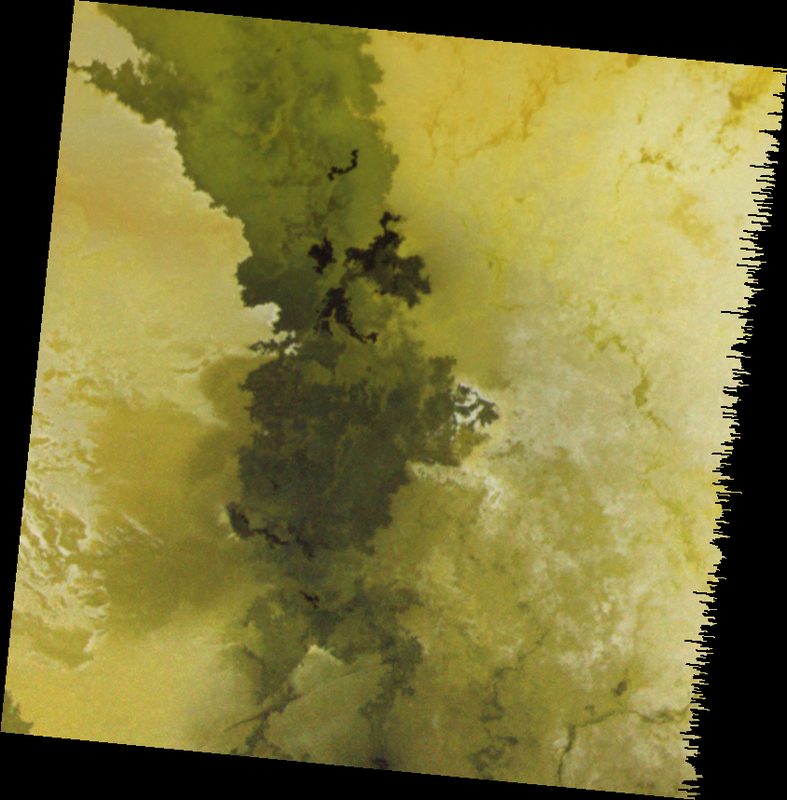 The first is a three-frame, green-filter mosaic covering the entire main flow field except the extension out west for the old Voyager-era Maui plume. The second is a single-frame, three-color (violet, green, and IR-756) composite over the center of the flow field. The third is a composite of the green-filter mosaic, the three-color composite, and low-resolution color data from C21 (shown at left). The Amirani flow field is a composite basaltic flow field. Basically, the flow field is a build-up of smaller flow breakouts. You can see here the main flow field in green with recent (as of February 2000) flows in darker greens and black. The green color is the result of a chemical interaction between condensing sulfur and the cooling lava flows. As the flows cool, more sulfur and sulfur dioxide can condense on them, brightening the flow field as it cools and ages. The lava at Amirani starts out at a patera near lower left and is then funneled east via a narrow lava channel or lava tube. The plume at Amirani erupts from the dark spot near the boundary between the middle and bottom frames in the mosaic.